SINDHUPALCHOWK, Sept 20: At the bottom, the Bhotekoshi River roars through gorge tearing the rocky mountains apart while giant rocks sit atop the mountain. In between of the deadly rocks and raging river, the Araniko Highway passes by a roadside town- the Liping Bazar. Once a vibrant commercial center, Liping Bazar nowadays looks lifeless. There is no movement in this town. Situated at the mouth of Miteri Bridge that links Nepal and China, the town once used to be frequented by traders trading in Chinese goods. However, nowadays the town has been out of business for a long time now. The great earthquake of April 2015 and powerful aftershocks took its toll on this most happening market and the thin settlement. Though a few tea shops and hotels that survived had started to run in the aftermath, the fabric that gave life to this market was tattered. Its residents expected that the business would resume once again and bring the town back to life. However, the long wait has not paid off so far. And the bazaar that is part of the Bhotekoshi Rural Municipality continues to wear a deserted look. According to a local Girmi Shrepa, 57, there was hope in the beginning. After the debris was cleared off the road and vehicles started plying, locals had expected that the Tatopani custom office would come into operation. After inspection of the area, teams of the customs office, quarantine and security had given a similar impression. “The situation was worse till a year. The road was in a pathetic condition. However, then gradually things seemed to change. 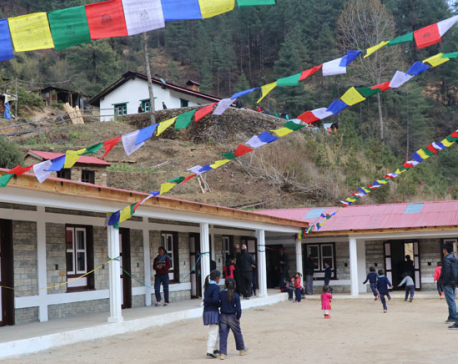 Visiting officials had hinted that the services would resume very soon,” Sherpa said. “Though the earthquake had left us fragile, we had started to become hopeful. However there has been no progress so far and we don’t know if we should be hopeful of bringing this town to life one day,” he added. After a year of the earthquake, transportation services along the Nepal-China border were in the process of resumption. However, another natural disaster followed and disrupted the plan. Due to glacial bursting, there was flooding in the Bhotekoshi River. This flood claimed around three dozen houses. Now, two years after the floods, the atmosphere at Tatopani is still the same. Even though the government has been trying to draw the attention of the Chinese authorities for resuming operations through the border post, the roads remain unrepaired. “Now this area is disconnected with the outer world. It looks so frightening, ugly that an individual cannot move around freely. We are living here because we don’t have a choice,” said Sherpa. Across the border, China has already worked a lot to widen and upgrade roads and resume markets. However, on Nepal’s side nothing much has been done. Let alone the road, some families are still living in houses that can collapse at any time. Debris of landslide and of the houses that were destroyed by the earthquake remains on the road. Landslide, grass, and bushes mostly cover the highway. “This place has lost its beauty. Now it only scares us,” lamented a security personnel at the gate of Tatopani custom office. “There is a risk of life here, rocks can fall and bury us anytime,” he added. According to a local Bhakta Bahadur Nepali, the sorry state of the highway has badly hit people’s lives in the area. In lack of an operational road, children have been not able to go to school and elders have been unable to do business and earn a living for their families. “Condition of the highway is very pathetic. At some points, temporary plank bridge connects the highway nowadays. In lack of resources, locals had used planks to ease the commuters. But if you have tread carefully over the planks, it’s very risky,” Nepali said. “As walking over the planks was very risky, children gradually, children stopped going to school and elders also limited their movement nearby areas only,” he added. Locals lamented that the government has not shown seriousness for repairing the highway and easing their life. Such apathy has brought their life to a standstill they shared. “We are not able to go to health posts, hospitals, Kathmandu or anywhere. Its like we have been tied here. If you try to get out of here, you have to put yours and your loved ones life at risk,” Nepali stated. “It seems our life is going in regression. It feels like we are living in the era of 70s,” he added. There are quite a few houses in Liping the locals built with their hard-earned money. Erecting houses in such a ‘deadly landscape’ was not easy. “We don’t have other assets. This house and there were some businesses. Now, we have no job and we can’t sell off these houses as well because who would want to buy a house in a deserted town?” Nepali lamented. The only government body that is operating now around the Liping market is the post of Armed Police Force. Other government offices are closed. Lack of transportation has made every essential commodity very costly here.